Don Pedro d'Alfaroubeira: Raspberry Sailing. How the Raspberry Pi makes sense on board. Raspberry Sailing. How the Raspberry Pi makes sense on board. A computer can be helpful on board, for several reasons. 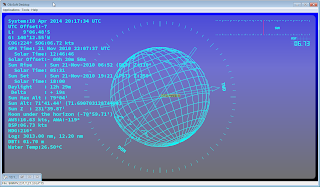 Some chart plotter softwares (like OpenCPN, the best) require a computer to run as well, to plot the current position on an electronic chart. The on-board electronics can be read from a computer (through NMEA, or some other proprietary protocols), and the data they emit can be used as parameters for calculations, like performance evaluation, routing, current estimation (tricky, but so useful). The data we are interested in usually (like in 99% of the cases) come from a Serial port (USB, or 9-pins). A big detail to mention is that a Serial port can only be accessed by one process at a time. That means that when your chart plotter accesses the serial port, no other program can access it, even it is is not the same data the other program is interested in. The chart plotter will be interested in the GPS data, another soft might be interested in the wind data; but there is no way around, one program, one port. GPSd does not address this issue (even if it pretends to), and - in my opinion - makes things more complex. It's only interested in GPS data (not in Speed Through Water, not in Wind Data, etc), but it locks the port like everyone else, and just rebroadcasts them in another bloody format! Why isn't it just rebroadcasting the NMEA sentences as they've been read?.., I have no idea. The Raspberry PI does much more than the boards like Arduino, Sparkfun, Beaglebones, and others (those are great, don't get me wrong, I am not spitting in the soup), it is a fully featured Linux (Debian) computer, that can - as such - do all a computer can do, like multi tasking, multi threading, remote access (SSH, VNC), network access (Ethernet and Wireless). It only has 512 Mb of RAM. But that is enough, as we will see. Its hard disk is replaced by an SD card, ranging from 4GB to whatever you want. I use 16Gb cards. And at work, it draws less than 500mA, which is ridiculous. You can plug several kinds of screen on the Raspberry PI, a TV screen using an HDMI port, or a rear camera car monitor (3.5", 4.3", or 7") using an RCA port. Turning those screens off when not needed will also contribute to save some energy. The Raspberry PI can read the serial port - Ok, exclusively - and re-broadcast the data on whatever channel (TCP, HTTP, UDP, RMI, whatever). This way they can be accessed from this channel, the data remaining the same. As soon as a device is turned on, it can join the ad-hoc network created by the Raspberry PI, and immediately read the data it broadcasts. A program like OpenCPN is smart enough to support several kinds of channels. HTTP is also an option to consider, smart phones and tablets are ready for that, without any modifications. HTML5 and CCS3 will do the job. Those devices have browsers that understand those technologies. It is very easy to display the data read by the Raspberry PI on an iPhone. In addition, the Raspberry PI can log the data read from the NMEA Port, its SD card is big enough to log several days of data. Another feature of the Raspberry PI is its GPIO Header. This is the bridge to the world of sensors. For example, the BMP180 will allow the Raspberry PI to read the air temperature and the atmospheric pressure. Those data can very well be injected in the NMEA stream (they both have an NMEA equivalent). 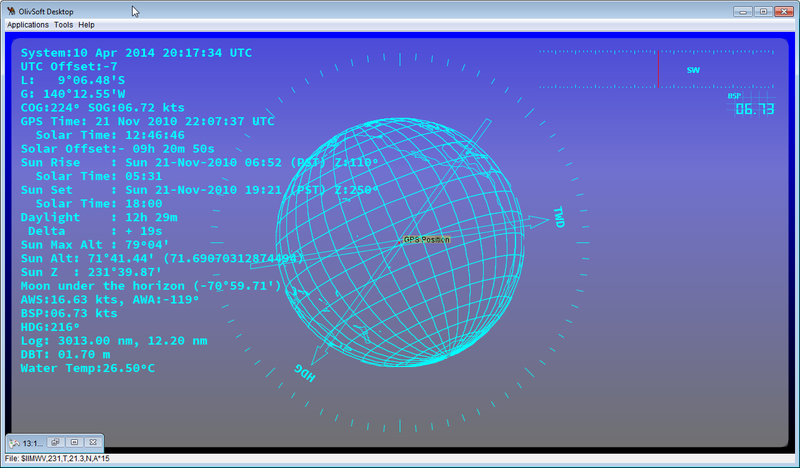 Some navigation station already provide this kind of interfaces, but in case yours does not, you will then get those data for less than $10. See some implementation details here. Even further, it is not difficult to come up with a small setting the Raspberry PI can use to monitor the tension of the batteries on the boat. This one does not - as far as I know - have an NMEA equivalent. It can be injected in the NMEA stream though, it will be considered as a custom sentence. And it can be logged too, along with the rest. If needed, the data can be displayed on the Raspberry PI as they are read. I did some tests with a graphical interface, as well as in character mode, just to keep the energy consumption as low as possible. The screen is turned off when not needed, for the same reason. Basically, you can reproduce the settings used during the last Aremica's Cup, for a tiny fraction of their budget! The Raspberry PI is less than $40. If it does not work for you, do let me know, it should. I might be able to help.